Work in progress: new projects are on their way. Have a sneak preview! Scraps, scraps, scraps - each project produces new scraps. 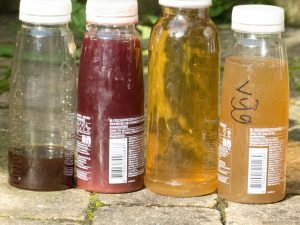 But scraps also mean new challenges, and endless opportunities! The writing of my PhD dissertation on stem cell donation and the unrelated donor search was an intense experience. For the cover of my book I designed and made a quilt. Want to know more about it? 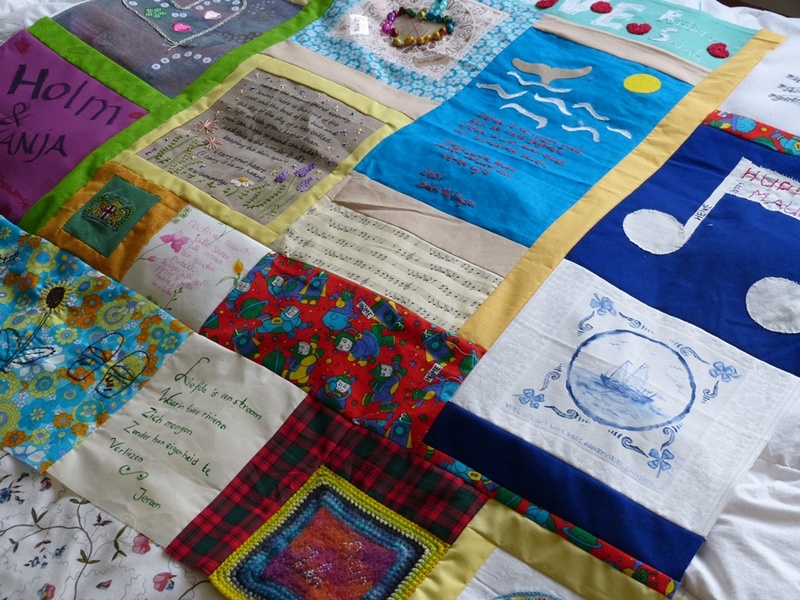 Read the full story of the "Crossing Borders Quilt"
KadK (Kunst aan de Kade) starts 2019 with an exhibition in Persingen. This year’s theme is ‘February – Winter – Ice’. As mentioned before, I have tried to work on new techniques and skills. 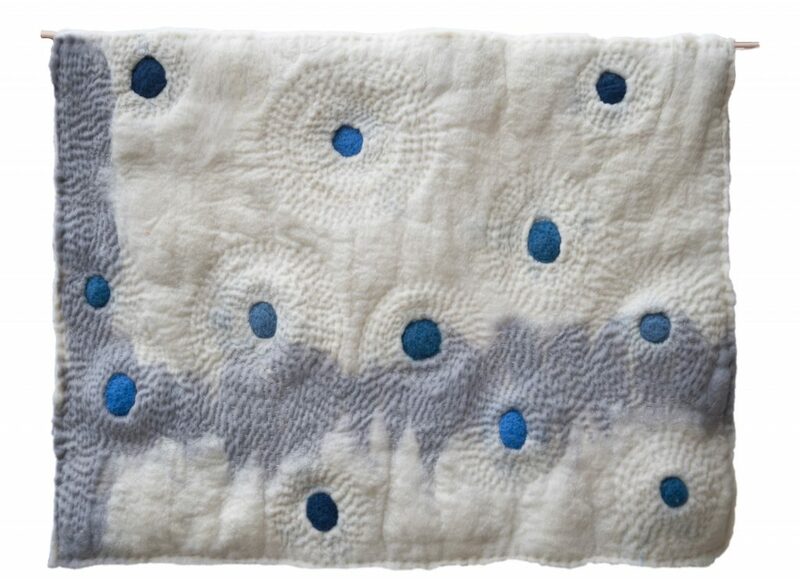 For this occasion I choose for felting (both wet felting and needle felting) in combination with hand embroidery. 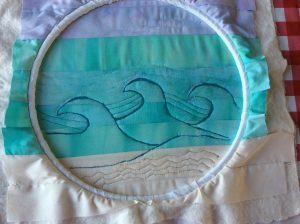 The online course ‘Exploring Texture and Pattern with Sue Stone’ was an amazing way to discover the almost endless possibilities even with a running stitch. Combining different yarns, varying in stitch-length, or distance between rows, are some of the basics that were so helpful in my journey of stitches and patches! In the first weekend of February you can view works of art in the theme ‘February – Winter – Ice’. 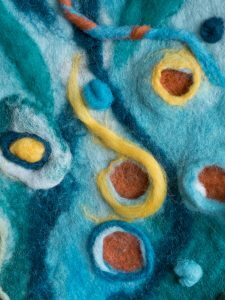 For this exhibition I have been working with felt: wet felting, needle felting and hand embroidery. 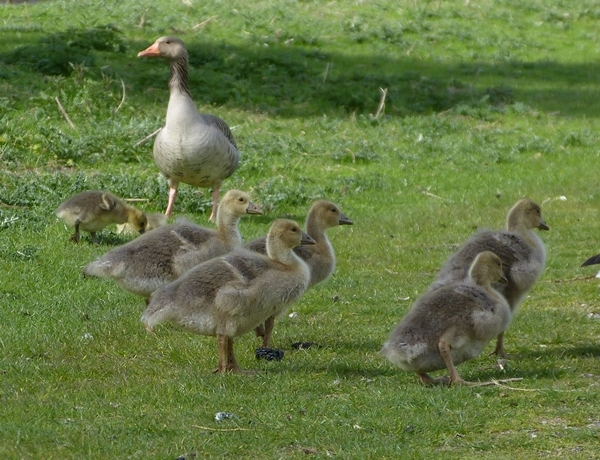 Working with natural material, such as fresh wool, is special. 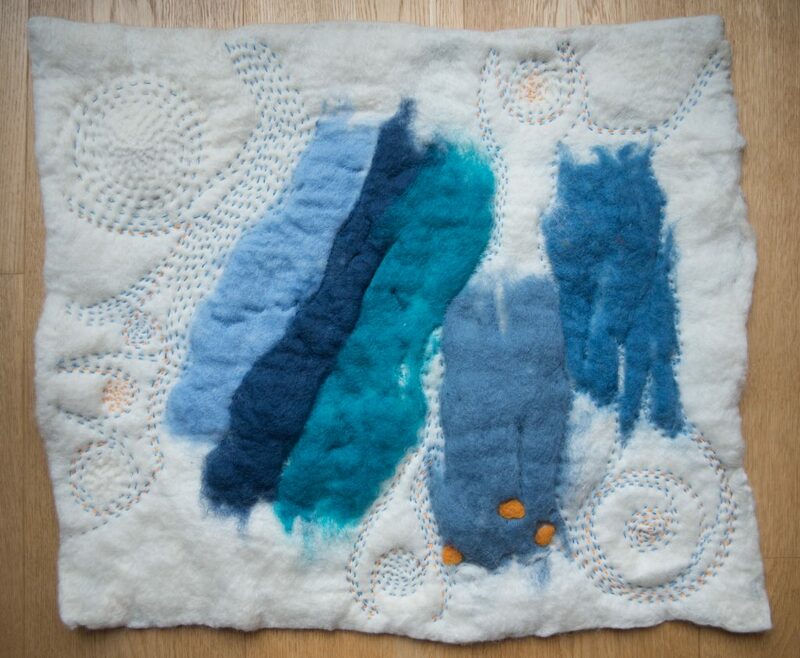 Wet felting is exciting: after laying out the pieces of wool, you might have an idea how it will turn out. 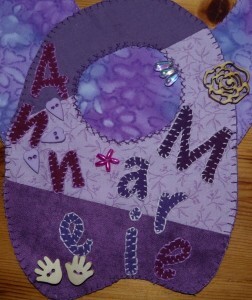 But each time the result is a surprise, and with embroidery you can add texture to the final results. 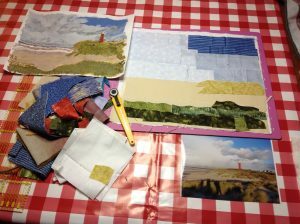 After finishing the Textile Art and Art Quilting course at DIY Textile school in Amsterdam, I decided to deepen my knowledge and skills on some of the new techniques I learned. 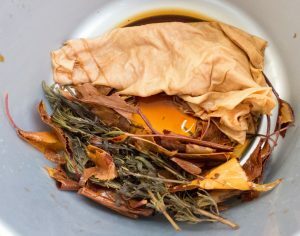 Dyeing fabric was one of these and I booked a one day course by Lucilla Kenny in December. 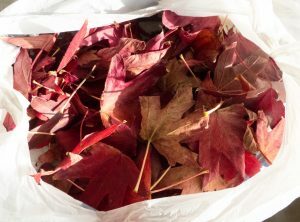 However, the trees in the street around the corner turned in a beautiful red in September, and I couldn’t resist to fiddle around with the leaves. 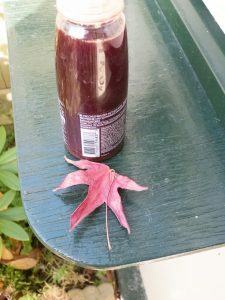 I found out it were Maple trees, and I started collecting the fallen amber coloured leaves, and also leaves from the Fig tree in our backyard. 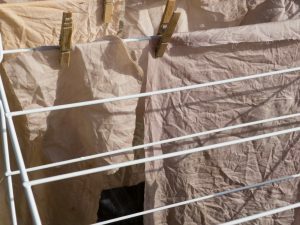 With the help of Google, I found some information about dyeing fabric with natural products, however, it was not completely clear, and I couldn’t find clear recipes. So, I decided to follow the instructions from the Mixed Media course (after all, the (powder) dye that we used there was also natural?). 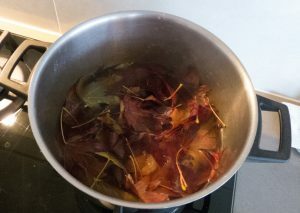 I offered an old pot and cooked and boiled and simmered the leaves on the kitchen stove, leaving my husband a bit worrisome (‘Are you sure this is not bad for our health?’), but I convinced him that it was all very natural! 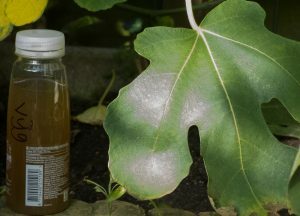 I prepared some cotton for the experiment with soda ash, and gave it a try! 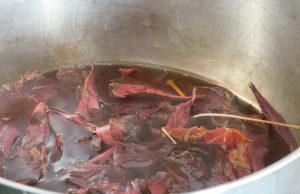 After the workshop with Lucilla, I realised that I had not used enough water, and that, if I had added a mordant, the result might have been better. But you know what? You are never too old to learn! 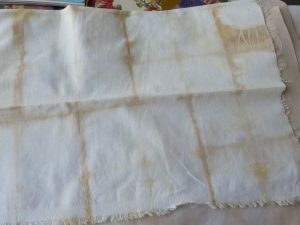 And I am sure, I will take another dyeing class with Lucilla in the future! 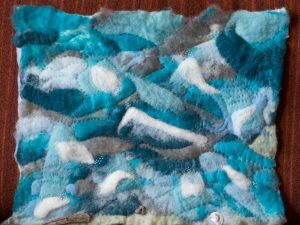 In the two years that I followed the Textile Arts and Art Quilting course at the DIY school in Amsterdam, in all my projects I focused on ‘The Sea’. 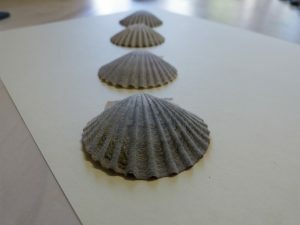 For research and inspiration I visited the beach many times, watched the waves and the seagulls, took lots of pictures, and collected shells on whatever beach I was. 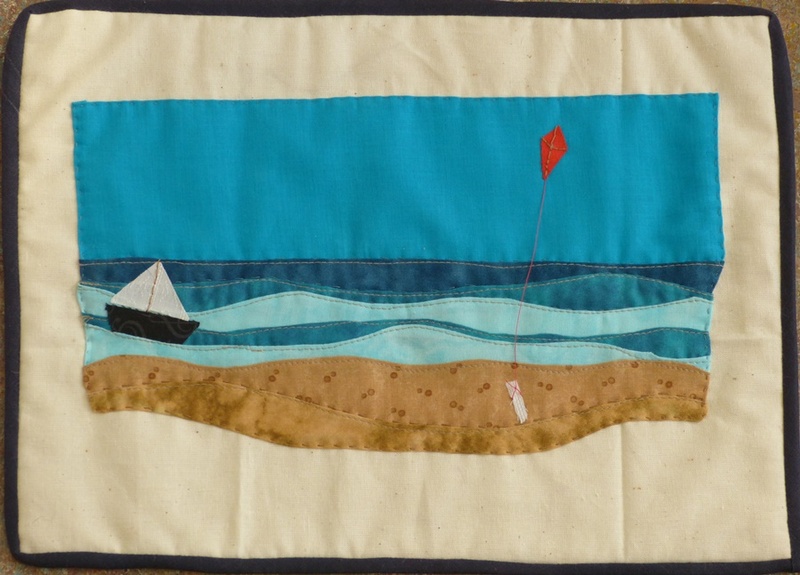 I studied ways to translate the waves into painting, drawing, and finally into fabric art. 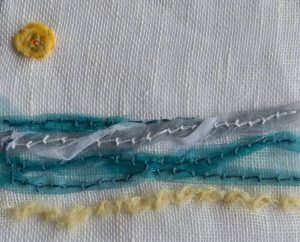 I tried different textile techniques – collages, weaving, hand- and machine embroidery, felting, applique. I started to draw (used to be afraid of a pencil before! ), and translate my thoughts into images. 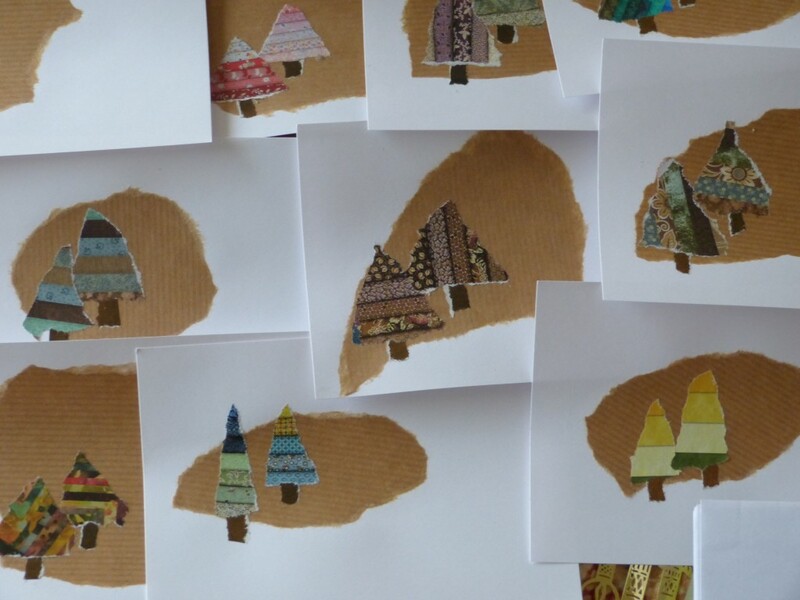 And some of these images resulted in textile art. “Plastic Soup” Detail. 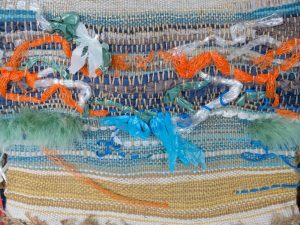 Weaving with wool, cotton, rope, plastic bags and packing material. 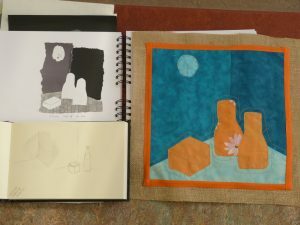 It resulted in a couple of fabric art works, and some of them were allowed in the final exhibition of the students in June 2017, in the Amsterdam House of Arts & Crafts. It was a journey well worth, and I cherish the memories and the friendships that is has brought me! 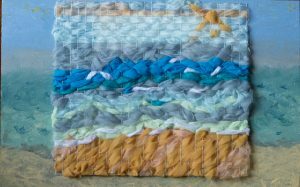 “The Sea” nylon, viscose, lace, weaving on chicken wire. Background oil painting on hardboard. 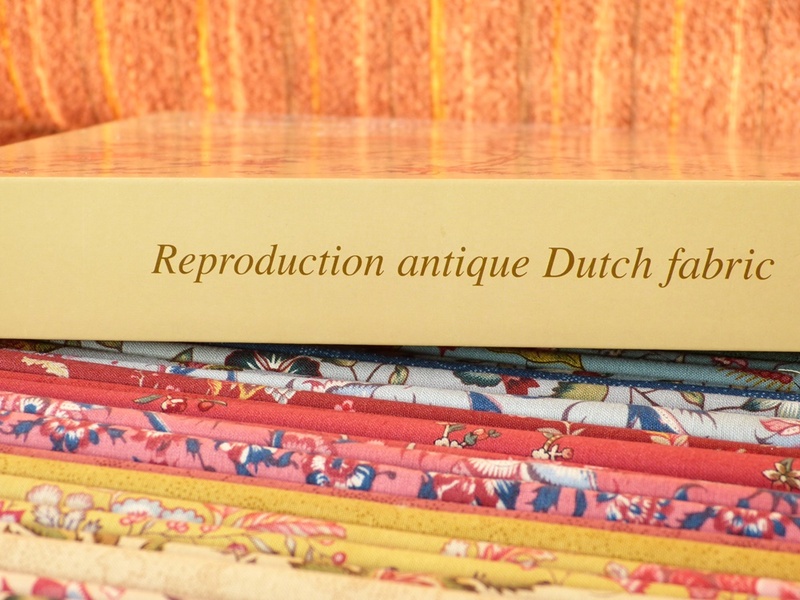 It is hard to believe that I am already half way the two-year course Textile Arts and Art Quilt, offered by the DIY Textile School in Amsterdam. So much new information, new techniques, new inspiration, and don’t forget the friendships! We started a What’s App group, and are keeping each other updated on the progress of our home work, but also share our doubts, questions, advice, and ideas for joint museum visits or workshops. 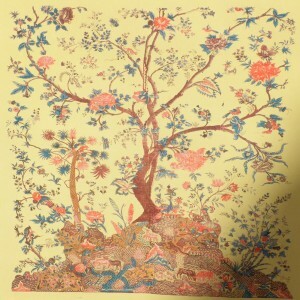 Different artists taught us about (textile) art history and the techniques they practice. I really enjoy my monthly trips on a Saturday morning to the DIY Textile School, and am impressed and inspired each time we show and tell about our work and exercises. It leaves not much time for other work, however, I know that there will be years to come to apply all the new techniques in future fabric projects! Happy Summer! 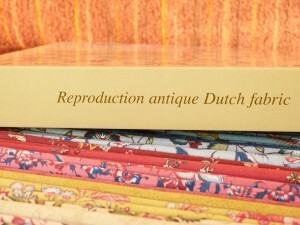 After finishing my PhD, I finally allowed myself to sign up for a 2-year course at the DIY-textile school in Amsterdam. And the first four course days are already behind me! 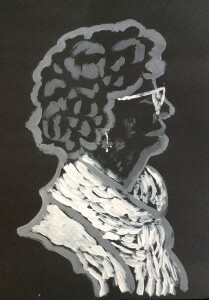 Developing new skills – like sketching and drawing; these have never been my favorite things, the results were always poor, and the teacher in high school looked always a bit pitying, when he saw my results! However, I realized that sketching and drawing are skills that can be developed, even in people like me, who think they can only use a pencil for writing ;-). And the internet is a great source for tutorials, like the one by Graham Shaw. I managed to draw a cartoon, and even dared to use paint to fulfill one of the first assignments. One of the main objectives of the course is to inspire and be inspired. And I can only agree that working on projects and assignments is so inspiring, (and also time consuming, but who cares? As long as you can do your favorite things?). The different teachers each come with their own expertise and skills, and their instructions and comments are really pushing the students forwards. Some of the exercises were so contagious that I hardly could stop. It resulted in alternative holiday wishes. 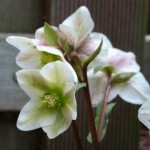 One of the teachers is in the DIY course is Jette Clover. 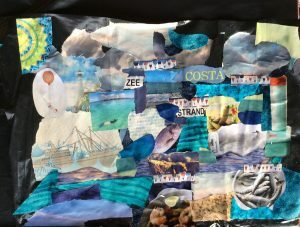 Jette is a very inspiring art quilter, working with mixed media. 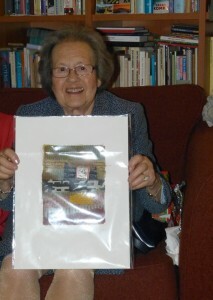 I gave my mom one of her Small Notes (Anne Frank) for Christmas. The year 2015 is almost over….my brother and his family who stayed with us for two weeks, returned to Canada. Time to work on DIY projects. 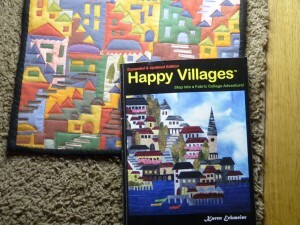 After paper collages, I switched to fabric collages, using the book ‘Happy Villages’ by Karen Eckmeier. 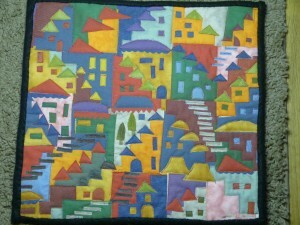 This was really a fun project, and also a very good exercise for free motion quilting with my Janome Skyline S5. 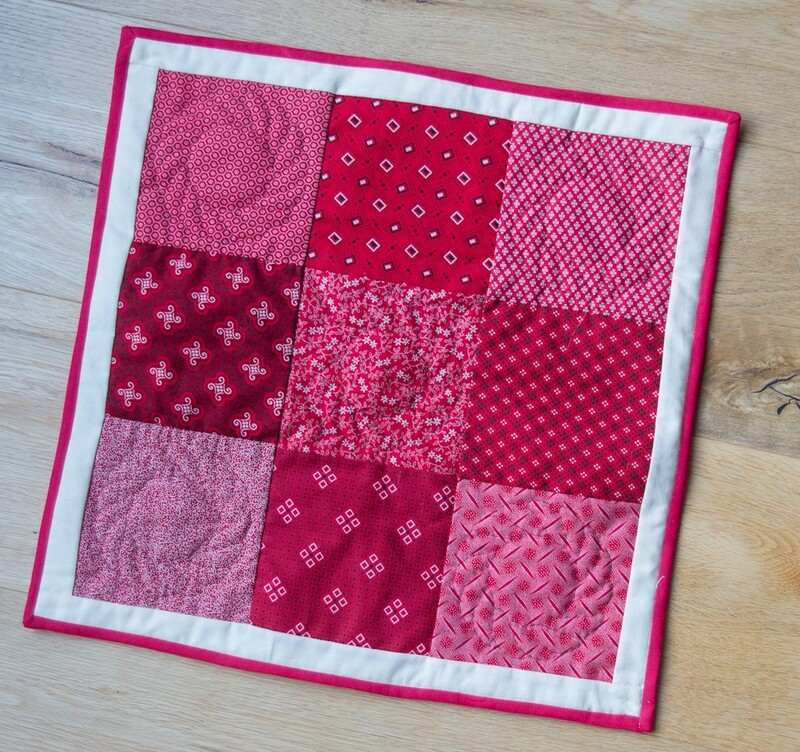 Never did machine quilting before, and must admit that I am not an addict, but as mentioned before, it is nice to develop new skills! Never give up! Happy 2016! 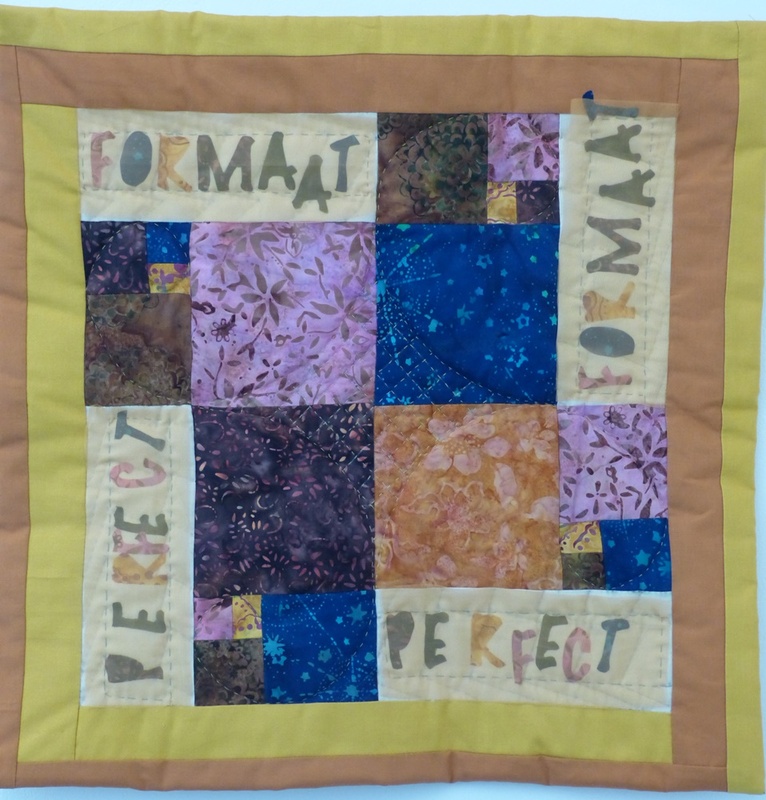 The annual exhibition of our Kunst aan de Kade group had as theme ‘Formaat'(size/dimension). We were asked to prepare work not larger than 60×60 cm. The Gallery De Stoker is located in Amsterdam. It is not very large, the we managed to fit in the work of all 10 of us! 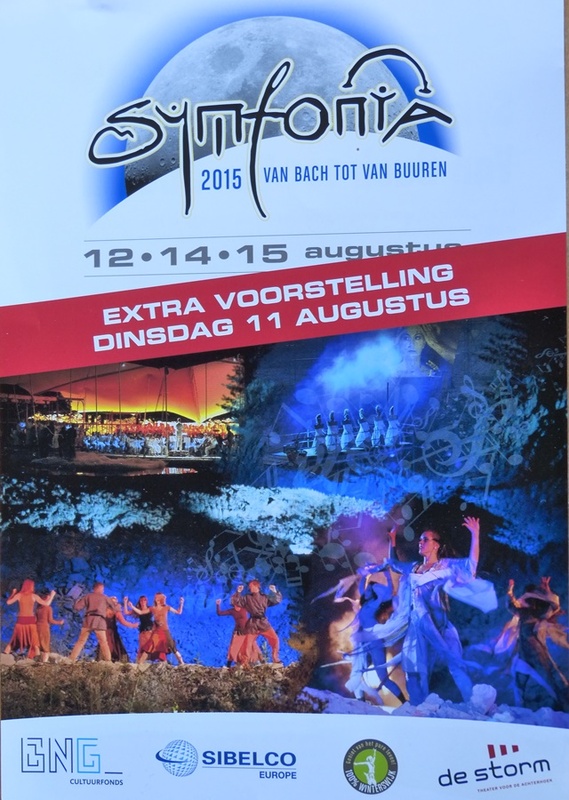 The opening was on the same Sunday that the Tallships left Amsterdam after Sail 2015. I prepared 2 wall hangings: the first ‘Perfect Size’ (Perfect Formaat) is based on the idea of the Golden Ratio. Inspiration came from a book: ‘Math and the Mona Lisa’ by Bülent Atalay (Smithsonian Books, 2006). A lot of measuring and figuring (thanks Jack! ), and it demanded rather precise cutting. 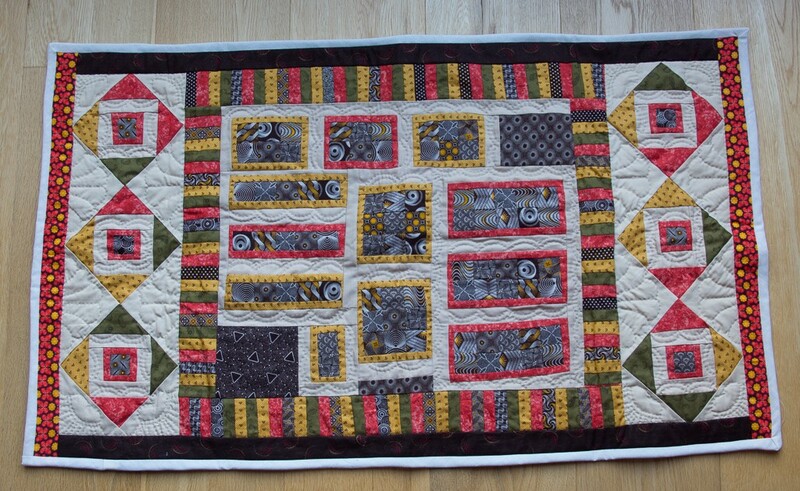 Pieced the whole quilt by hand using batiks that I once bought a couple of years ago during a Quilt show. 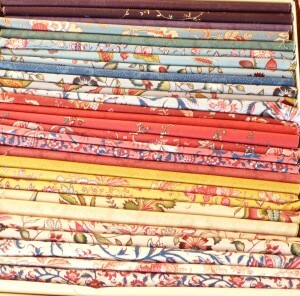 And finished with some Moda solids that I found online in a sale. Just the perfect colour! 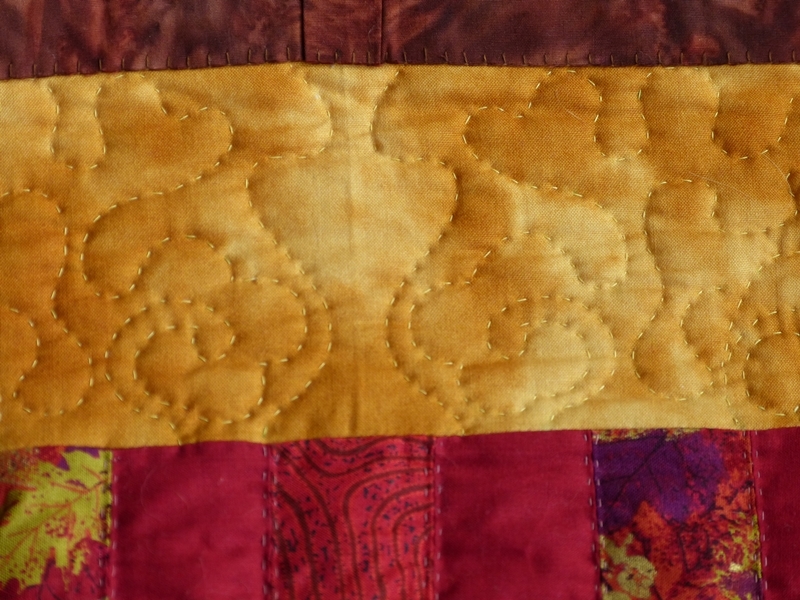 Quilting by hand, following the Perfect Ratio Logarithmic Spiral. The second work is called ‘Quite a Fish’ (Vis van Formaat). Red fish are swimming in all directions surrounded by aquatic plants. 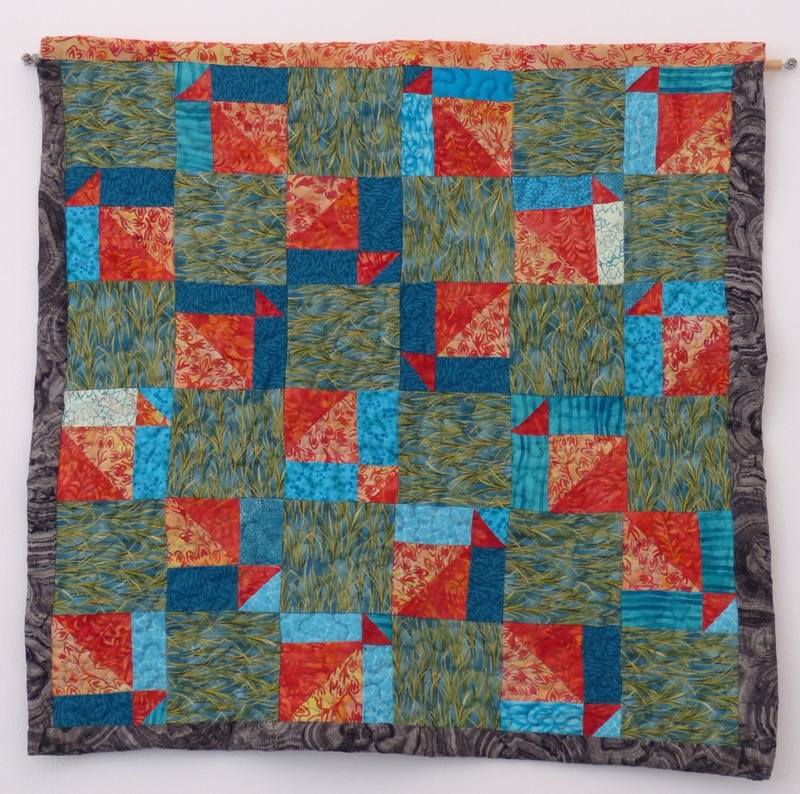 A combination of red batiks and blue scraps. 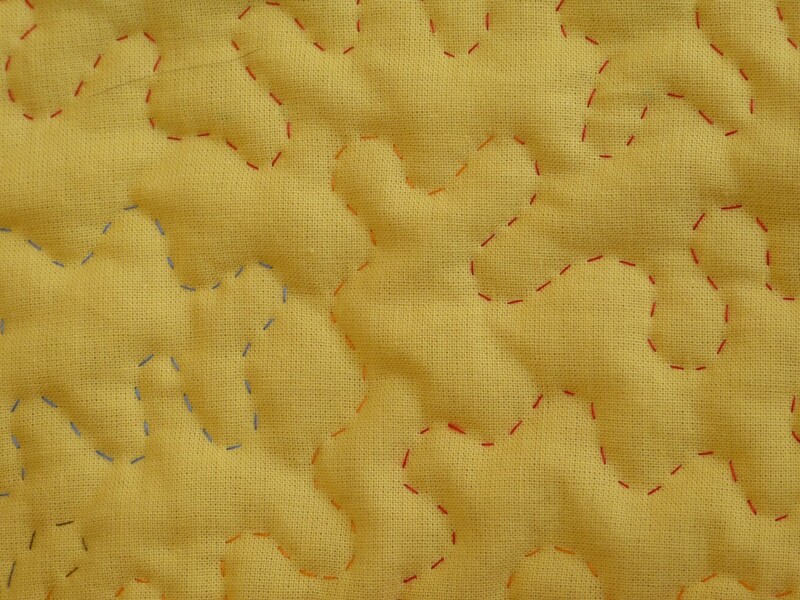 The piecing done with my new Janome Skyline S5 that I bought this Spring. It is my PhD gift, and so far I am very happy with it! Quilting by hand, something in the middle of free motion and stippling. 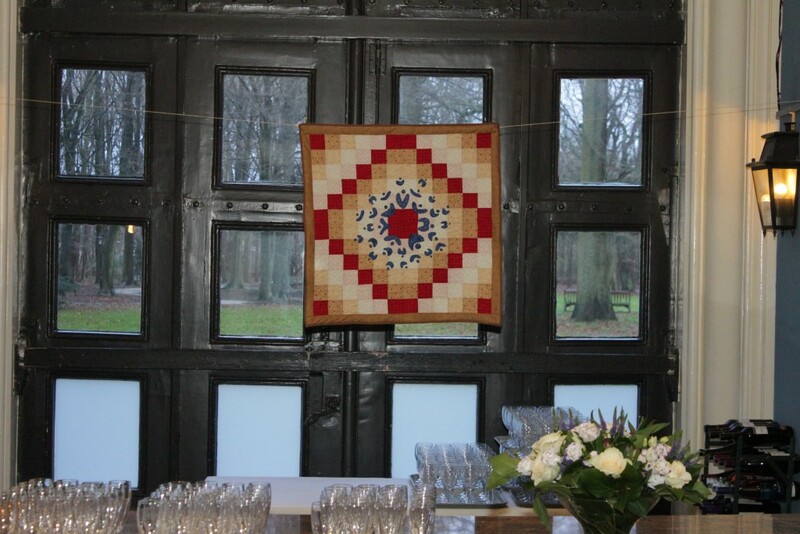 The quilting was mainly done during a stay in Winterswijk with my oldest daughter in August. 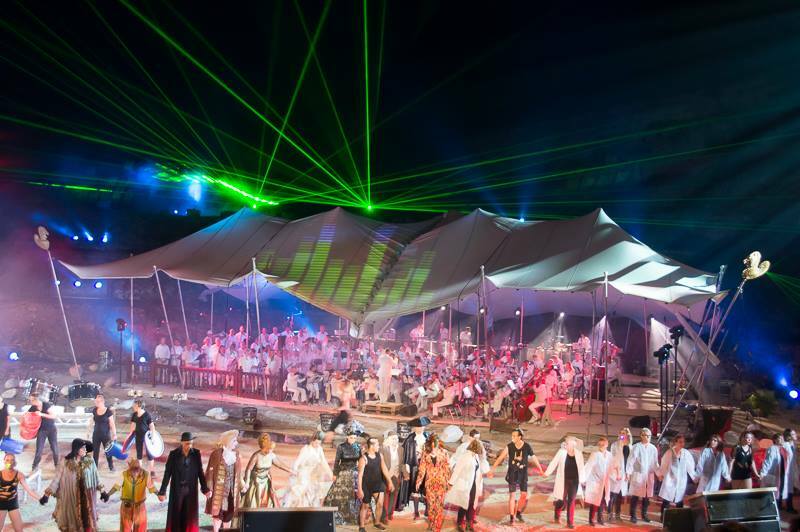 We participated in the Steengroeve (stone quarry) Theatre project Symfonia II. She played in the Achterhoek Metropole Orchestra while I was helping as a volunteer. Showing the guests to their chairs, cleaning afterwards, but best of all: enjoying the show every night of the week! A first sample, showed during the wedding party. It was a real puzzle to fit the pieces together to a top, but with colorful sashes I think I succeeded. 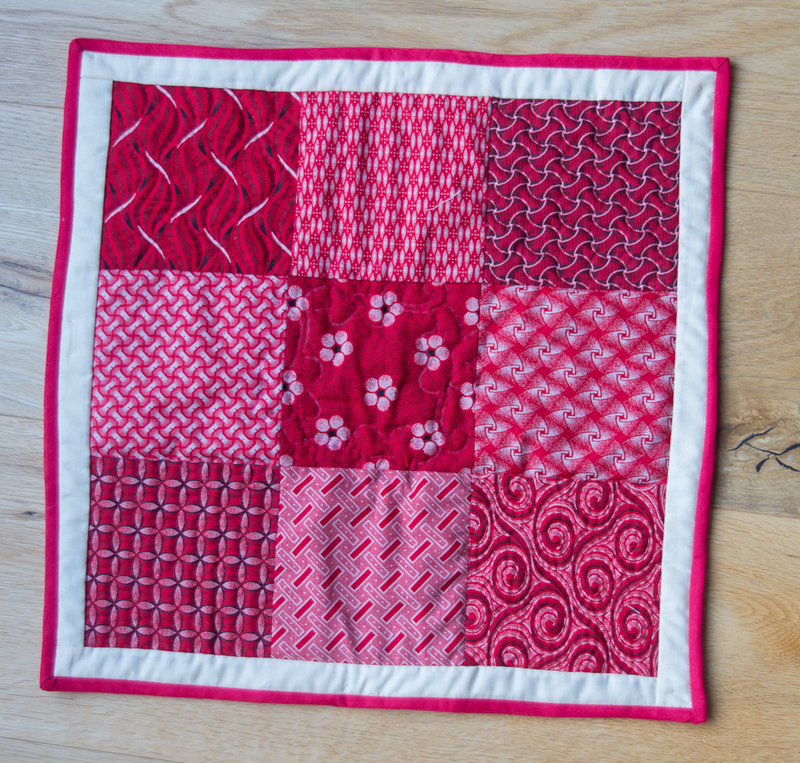 After assembling all the parts, I had to decide on the quilting! 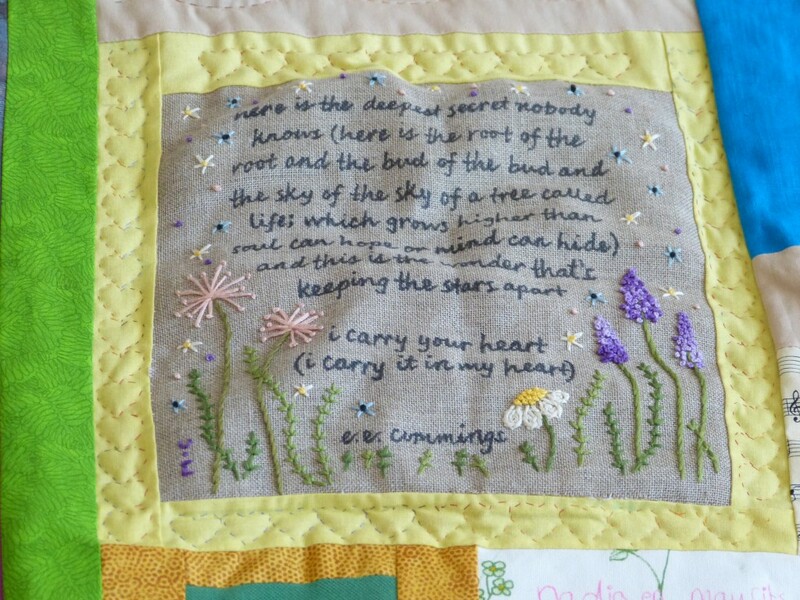 Hearts of course, because this is a Quilt of Love, and some free movement stippling (representing the free mind) and chains for the togetherness. 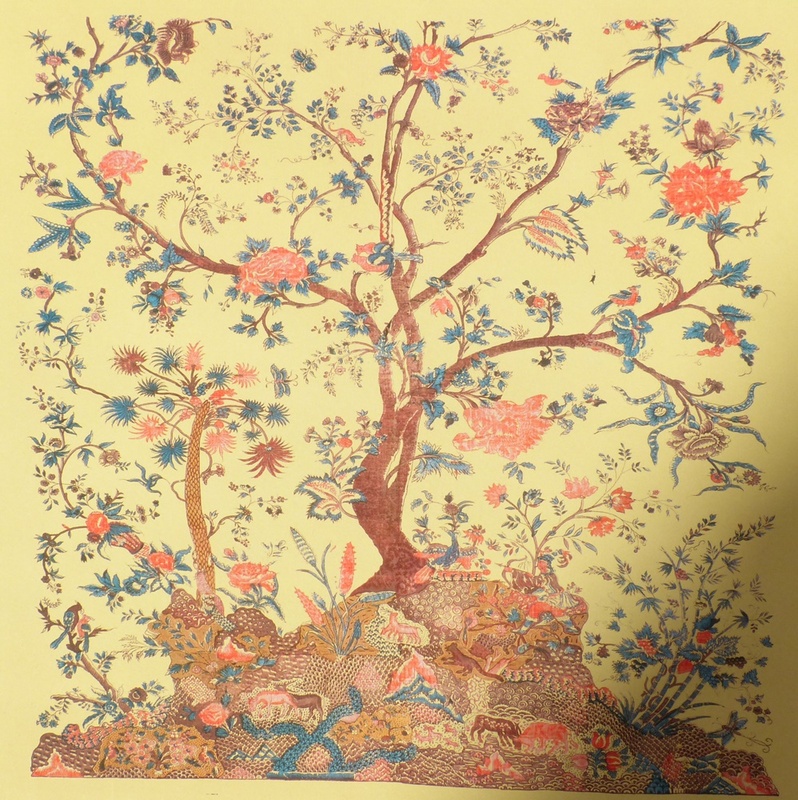 The top was hand quilted, and the final size is 120×200 cm (47×78 inch). 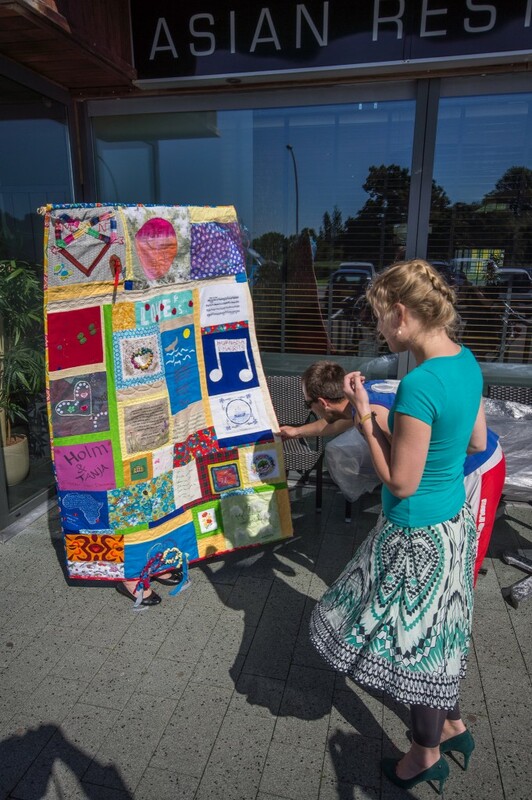 On June 6th, the moment finally came where they faced the result and received their Quilt of Love. 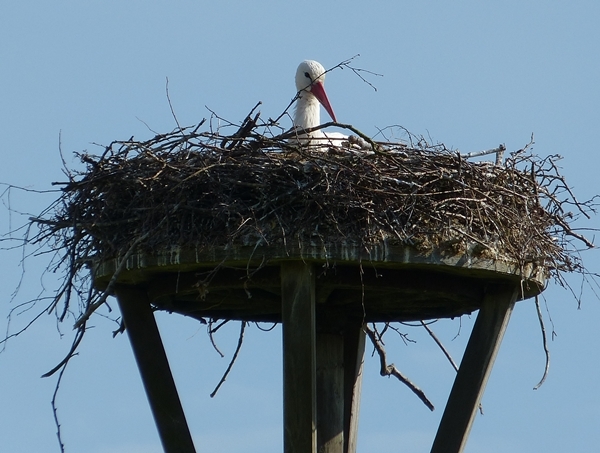 January 2015 – a new start? The end of 2014 and the start of 2015 were captivated by the defense of my PhD dissertation Focus on the Donor. Crossing Borders was of course present during the party in Castle Oud Poelgeest. 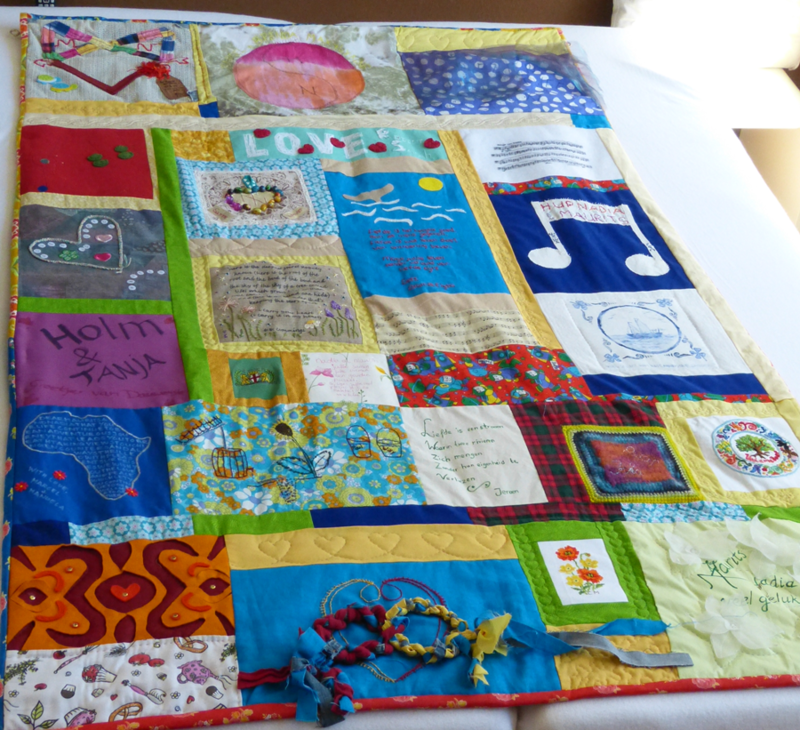 Apart from the quilt I made for the cover of my book, I also made gifts for my fantastic promotor professor Anneke Brand and co-promotores Lynne M Ball and Machteld Oudshoorn, who have supported me over the years with their enthusiasm, advice and always positive criticism. Since my promotor is famous for her love of chocolat (a day without chocolate is a day wasted) I made her a wallhanging with a wink to her preference. The material was given to me by my colleagues Terry and Veronica in South Africa, and reminded me in a way of the chocolates by the Australian. I added Kona Solids (champagne) and Andover Jo’s Best Friends. As usual I started with a vague idea (chocolate drops in boxes in a window screen). 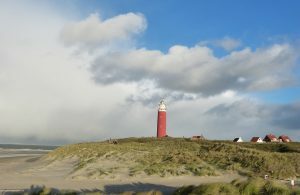 and as usual the work developed itself; I am happyl result, and was did Anneke. 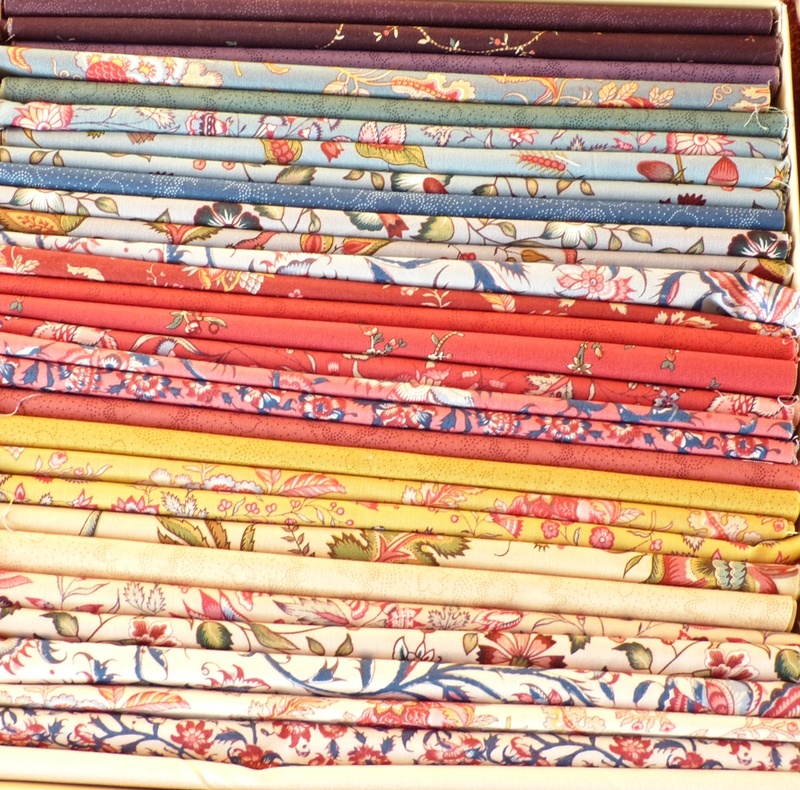 And she surprised me with a Dutch Heritage box of the Den Haan and Wagenmakers, super-candy for quilt-lovers and fabric-addicts. 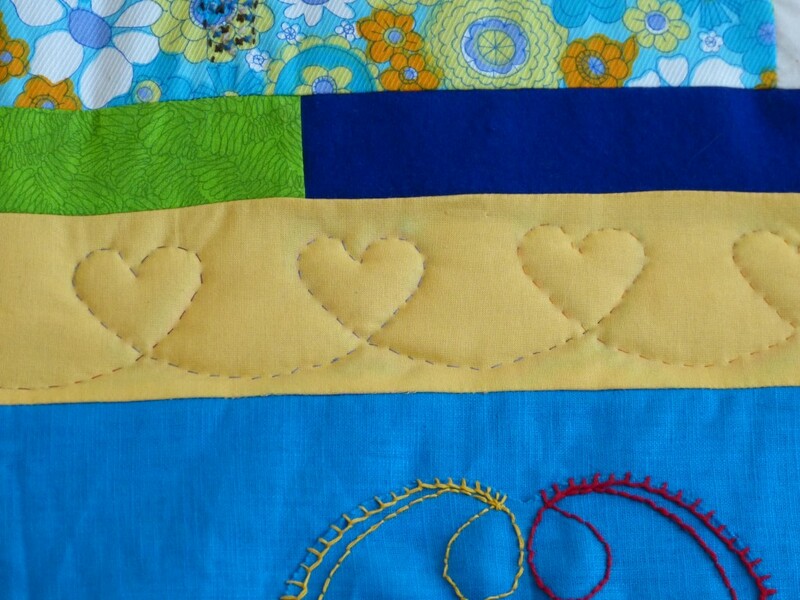 ‘Do you dare cut it?’ asked my quilt-friend when I told her. ‘Uh…no’. ‘Well, than you have to pet it’, she said, and so I will do. For Lynne and Machteld I also used red fabric from South Africa, which resulted in two small quilts: Redworks I and II. All three were machine pieced and hand quilted. The finishing of my dissertation, which almost became a lifetime project is a fact. However, it still feels a bit unreal. I am pretty sure I’ll get used to it, and especially to the freedom and the time to develop new projects. 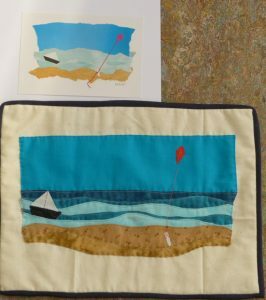 Since a life-long learning is one of my principles, I have applied for a course in Textile Art Quilting at the DIY Textile School, which will start in September. To prepare I will started with a short course Mixed Media, which will start in February. Homework for the first day of Mixed Media: check! 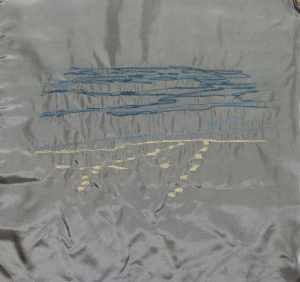 I can’t remember where it was posted, but earlier this year I read this blog about unfinished objects (UFO’s). The minute they are mentioned, you remember half-finished tops and often it is unclear why they were never finished. So I promised myself to finish a UFO before I start a new (grand) project. 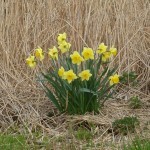 Smaller projects need to be done as gifts, so they are allowed to be started. One of the UFO’s is a top of a small quilt I started literally ages ago. It was sitting there in a box and each time I took it out, I loved the colors, but had no idea how to finish it. However, I was in the mood to try something new and decided to go for a challenging quilt pattern. 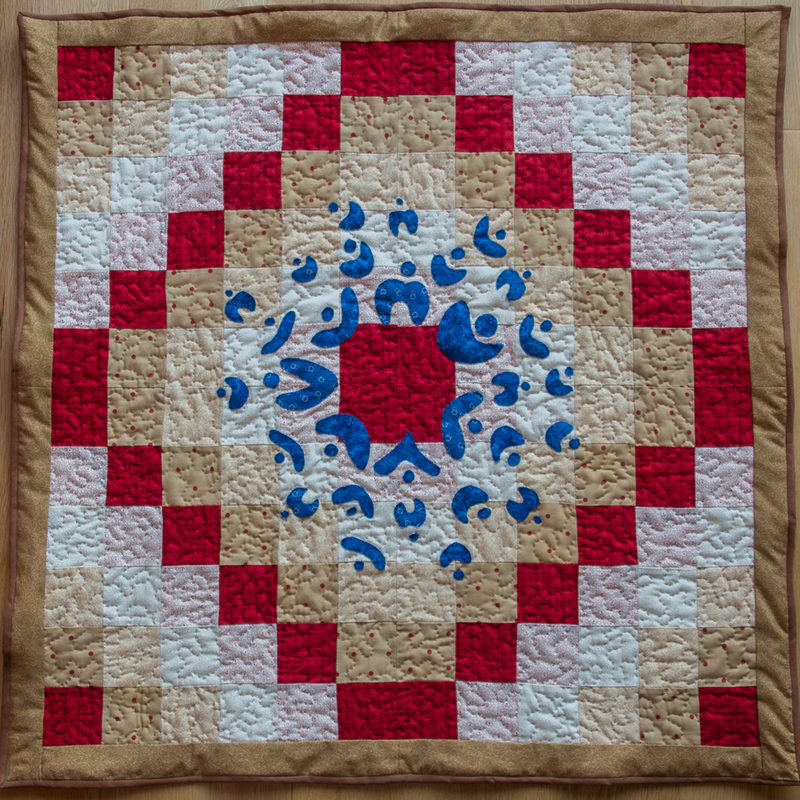 I used the 342 Feather Circle quilting stencils 10.5 inch by the Quilting Creations International company, and so far I really like the results. Another big UFO is a quilt for the guest bedroom – I also have to decide on the quilt pattern. 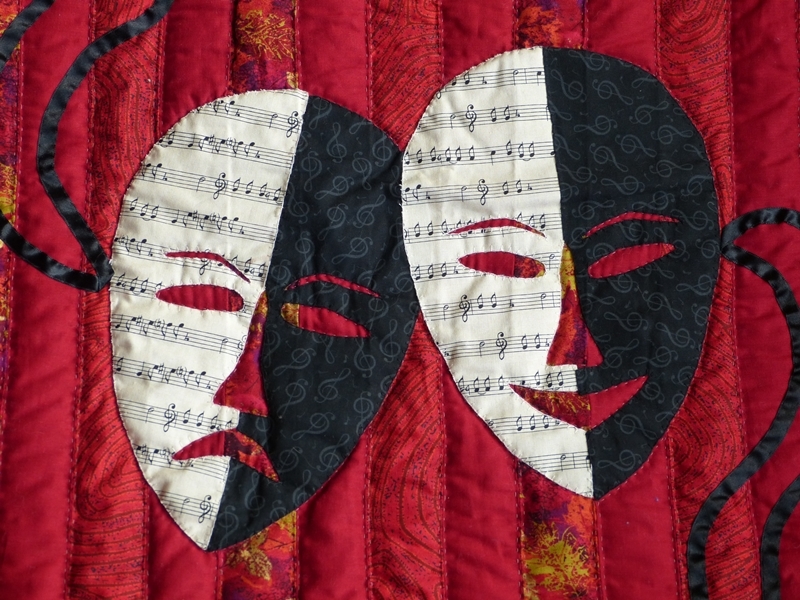 Since I do all the quilting by hand (moments of meditation), it takes some time to finish. 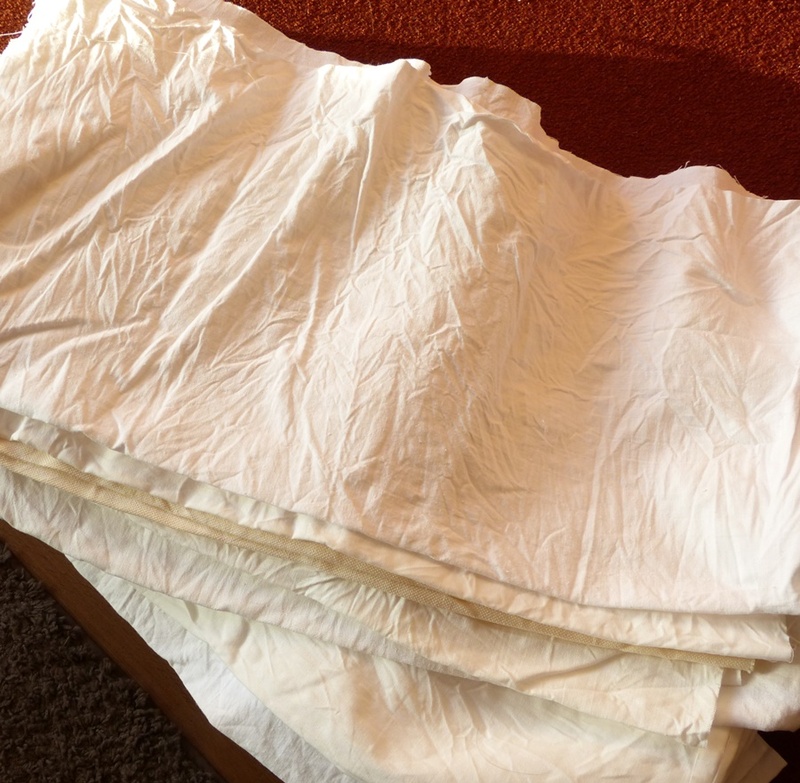 ‘The Golden Ratio’ – idea from Jack to see it this also works with fabric. He gave me the book ‘Math and the Mona Lisa’ to read and figure out this principle. My math skills are still a but underdeveloped, but with fabric it might be different and give me inspiration. I have decided to use some batiks that I bought earlier this year during a creativity fair that I visited with my quilt friend. A visit last week with my niece to the Exhibition Escher in the Palace is also triggering new ideas. 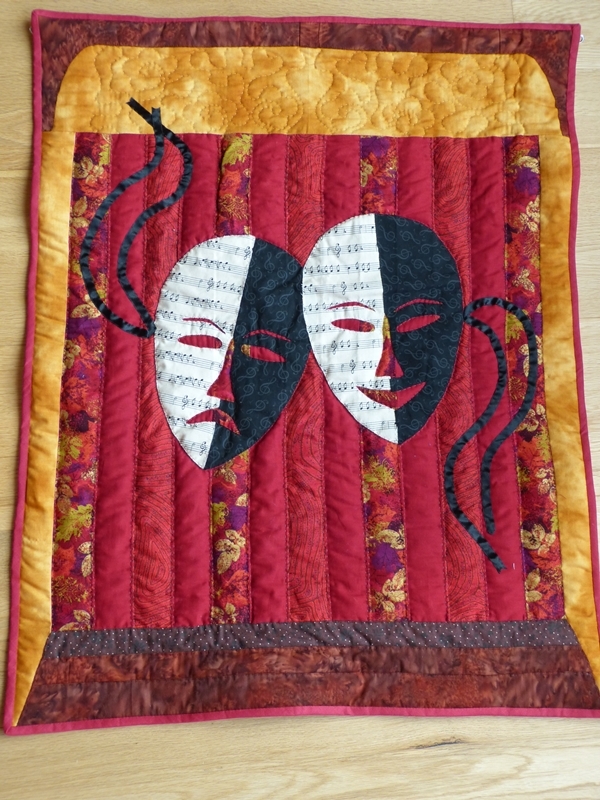 ‘Farewell Blanket’ – request of a friend, who wants to have a quilt that can be used for funeral ceremonies within his family. 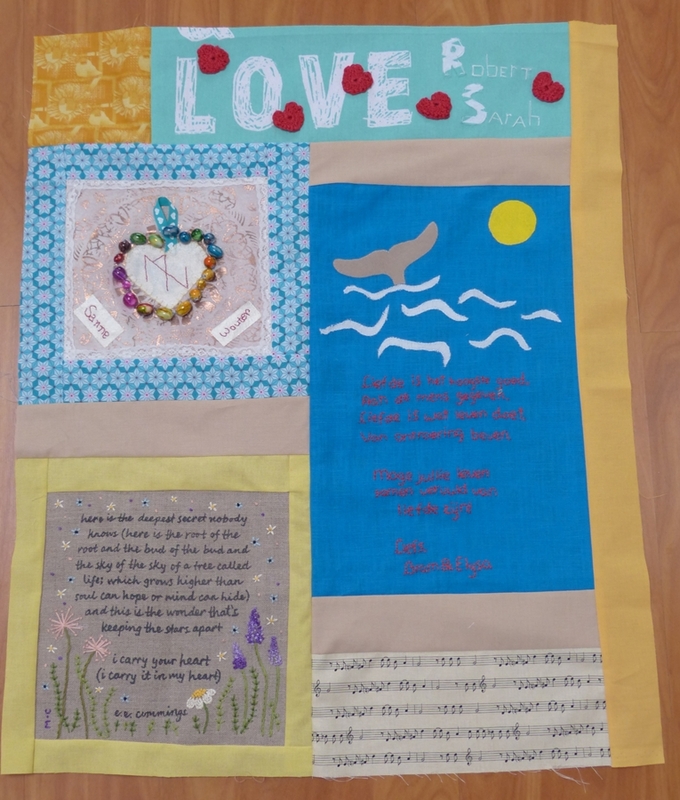 It can be compared to the use of a special family garment for baptize ceremonies; he would like to have a special family quilt. 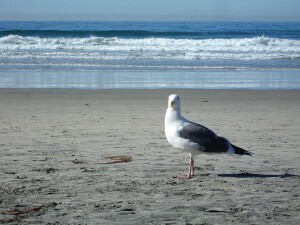 Luckily there is no urgency, so I have some time to think it over, and I have realized that I need that. It will be a major project. KadK project – no new project set for now, but sooner or later, someone will decide on a new theme, and then it’s off to prepare one or more pieces for the next exhibition. 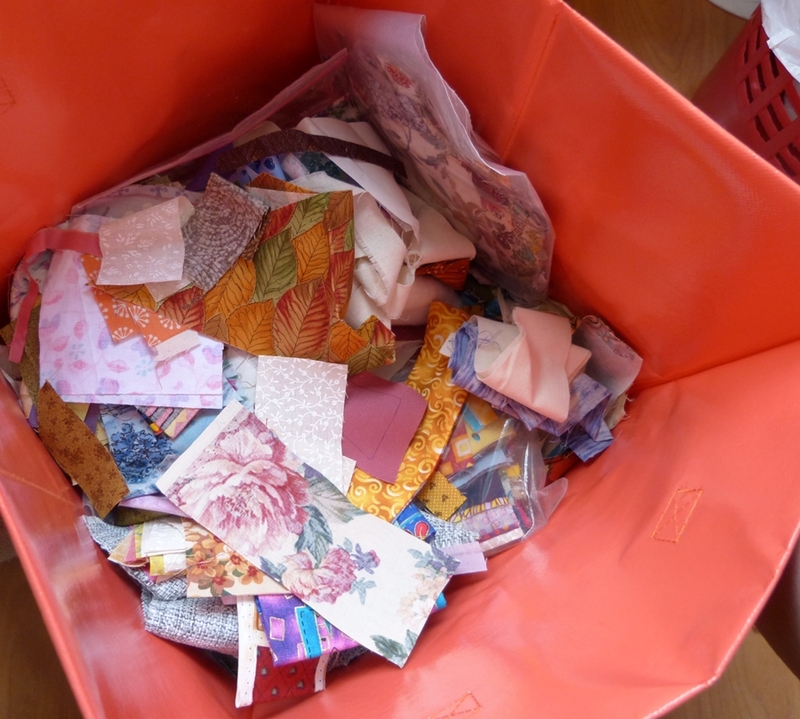 Scrap projects – the blogs of Bonnie Hunter are so inspiring, that I decided to start a scrap bin. More news will follow soon! 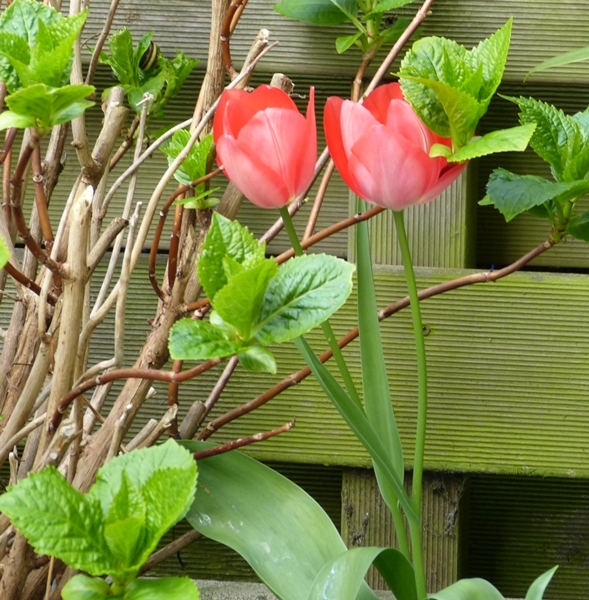 But not only the flora is showing off, fauna is also flourishing! 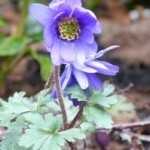 Spring is the signal to start new stuff. 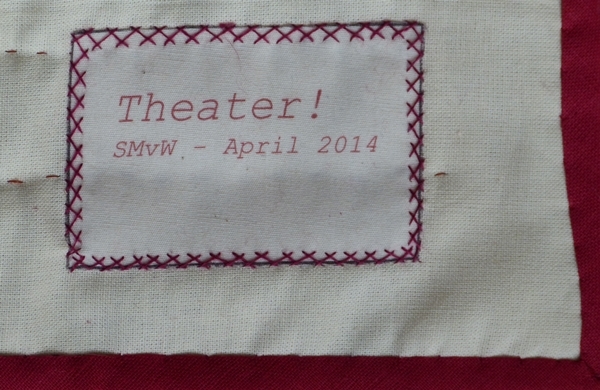 I had just finished my wall hanging “Theater!” for the exhibition in the Laaktheater in The Hague. So we went to IKEA and after returning home, Jack assembled the new closet for my quilt room. and I ordered my stash. 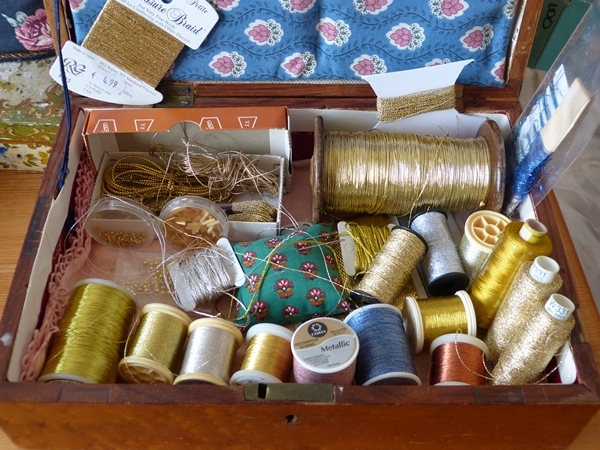 It’s always nice to run through your fabrics, with some ‘oh yeah’ moments and ‘why should I keep this any longer’ decisions. 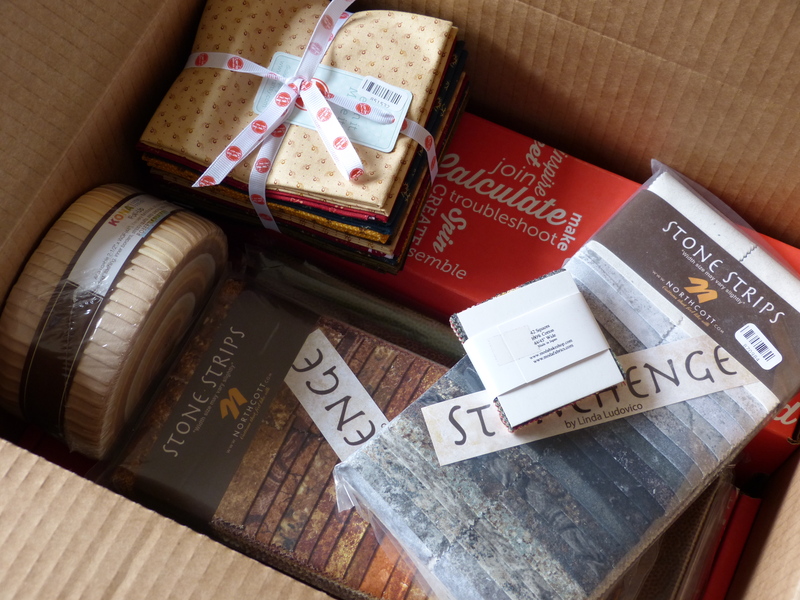 Besides I needed some space, because I expected an parcel with fabric. 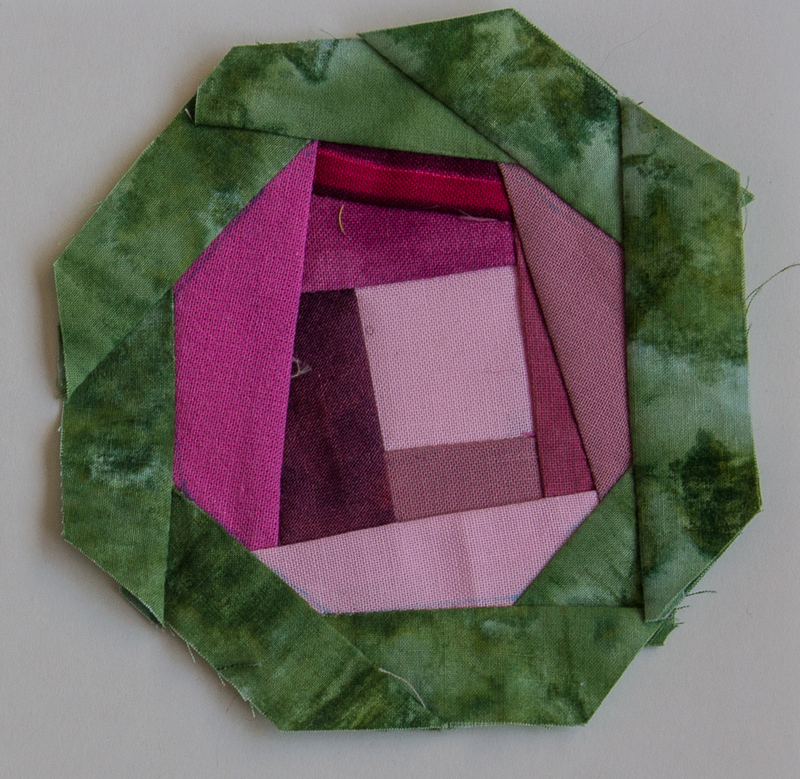 And after cleaning up and sorting out: it’s a relief to start piecing!